December 1999 No images selected for December 1999. 24th October 1999 was a classic trough line situation. 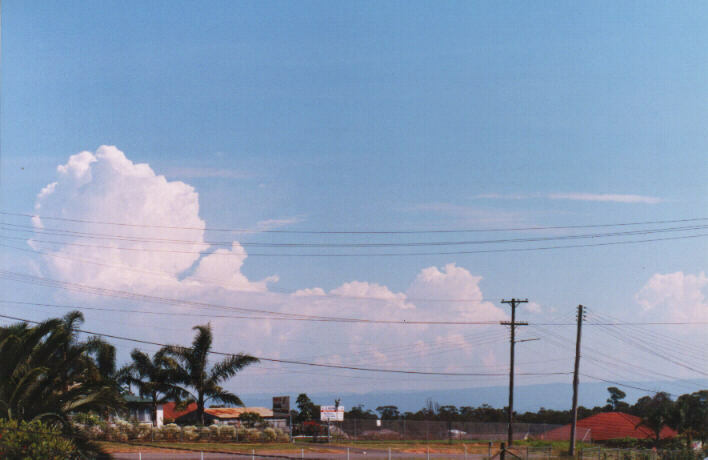 Overnight rain cleared by 8am with some impressive cumulonimbus developing as the cloud mass approached Wollongong. To the NW, in the clearing more cumulonimbus developed. 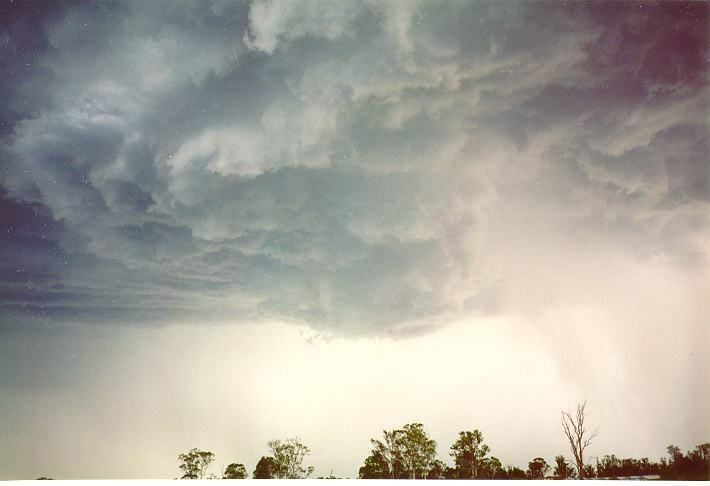 Thunderstorms developed so rapidly that by midday, there were severe storms from the Mid-North Coast to south eastern Queensland; some of them supercells. Large hail was reported from several storms. One of the most interesting evidence of the favourable conditions required for tornadic development was the rotational shear. 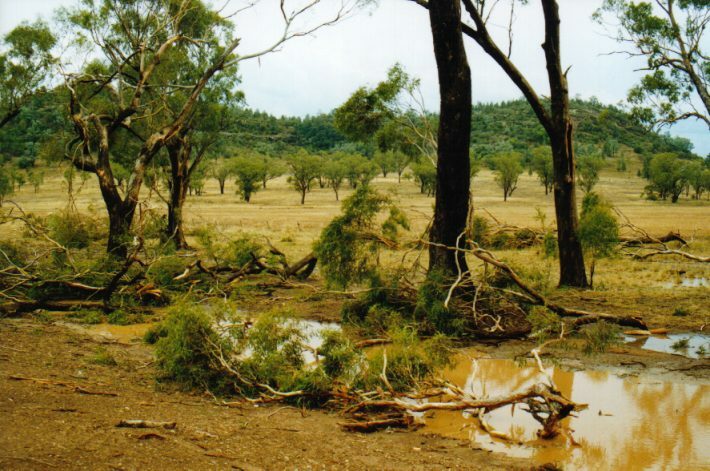 18th December 1995 was a classic trough line situation. 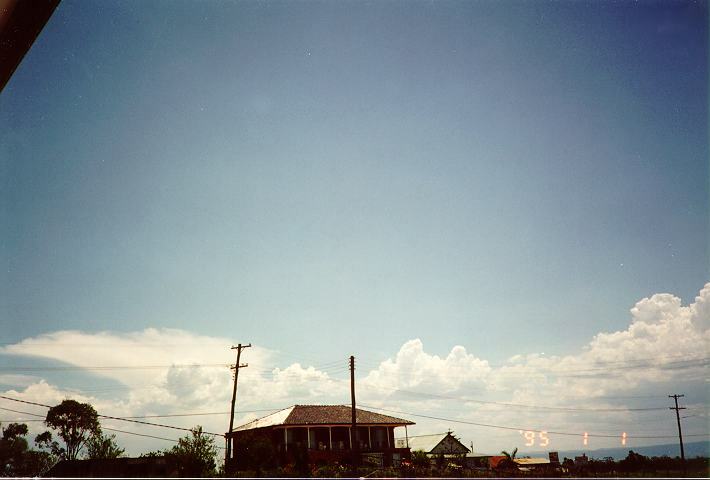 Early in the day, altocumulus castellanus formed a band near the coast. During the late morning period, the line began to explode, one bulge after the other. 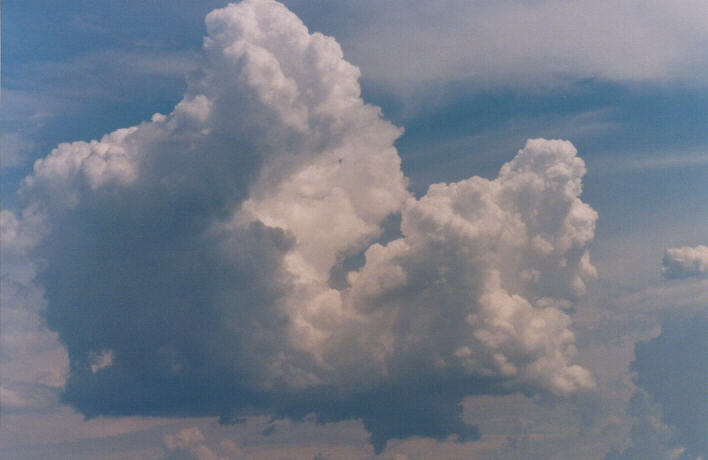 Cumulus developed over the next few hours with some developing into cumulonimbus. 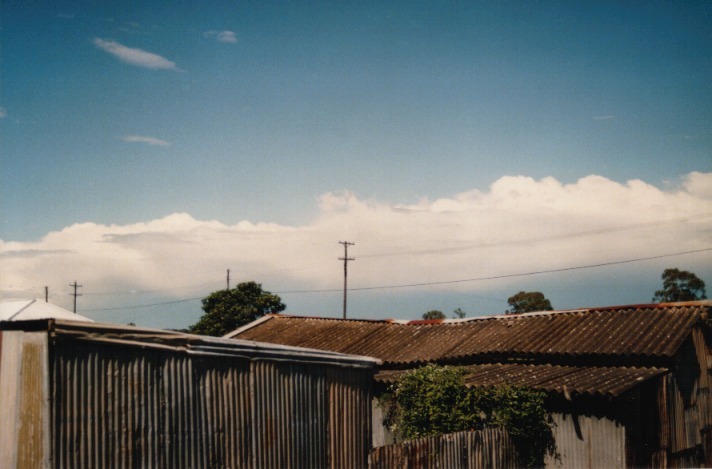 But the cumulus began to clear as the dry, blistering air hit. 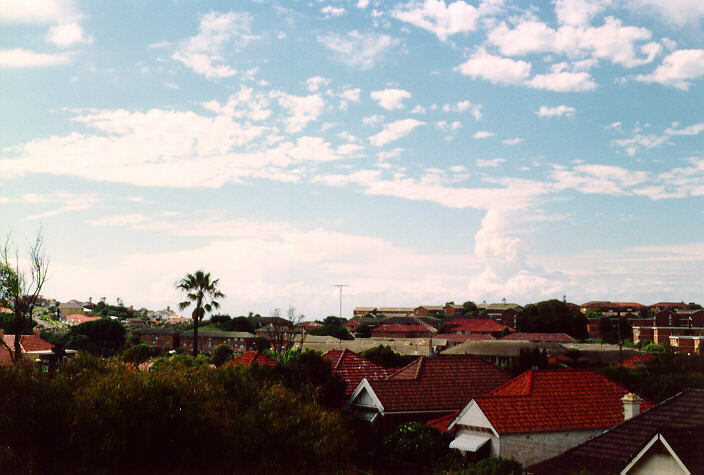 From the top of Rooty Hill, you could see cumulonimbus developing nearer the coast, some with overshoots and they occurred in two separate bands about an hour or so apart. I am uncertain whether these were over land but had the line been 50 kilometres west, the situation would have been interesting. 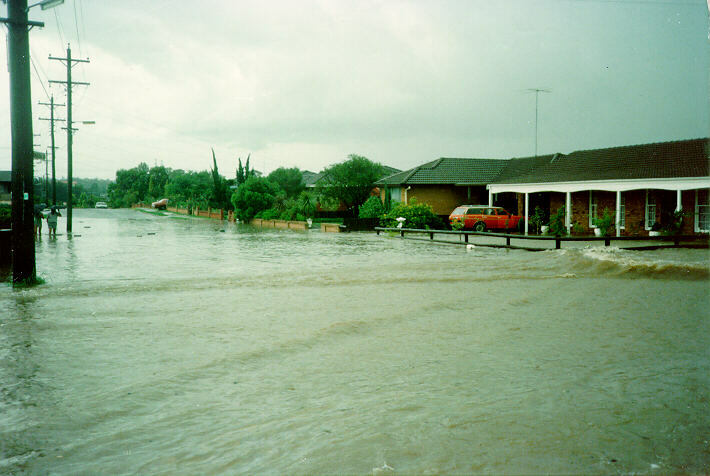 February 1990 was a special month in Sydney with regards to severe storms and also floods. February the 10th was no exception. During the morning, altocumulus castellanus littered the sky. 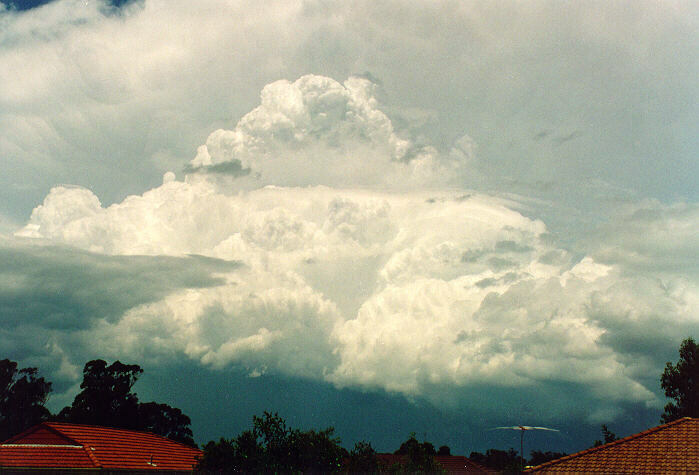 Cumulonimbus approached later with a light green tinge widespread and spectacular shelf cloud. Hail was observed at Merrylands up to marble size in diameter. However, it was the deluge that came from this storm that lasted one hour or so. It dumped around 100mm of rain in several suburbs. 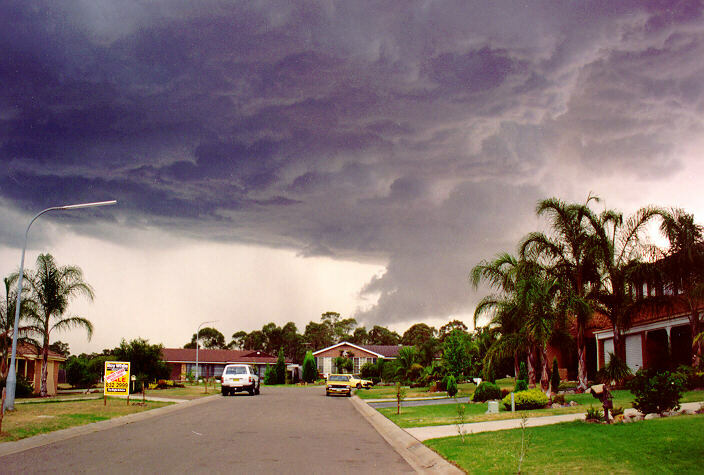 Flash flooding occured in many suburbs including Smithfield, Merrylands and Granville. 12th April 1990. After overnight showers, a mild northerly wind developed. 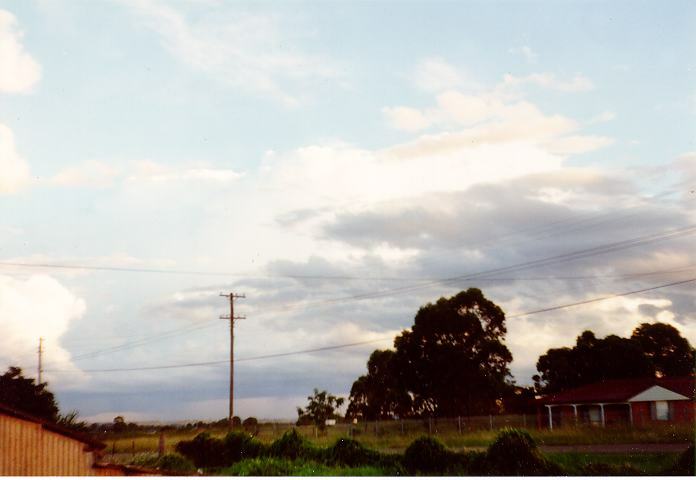 Altocumulus and altostratus persisted from the north with isolated showers. 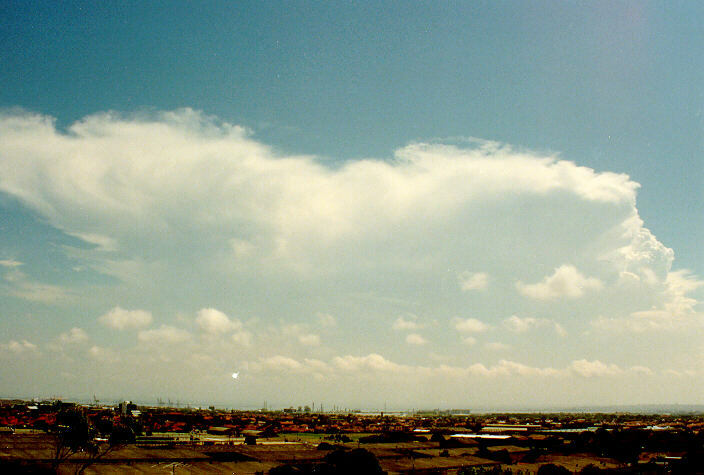 Cumulonimbus then developed to the west and northwest moving south. 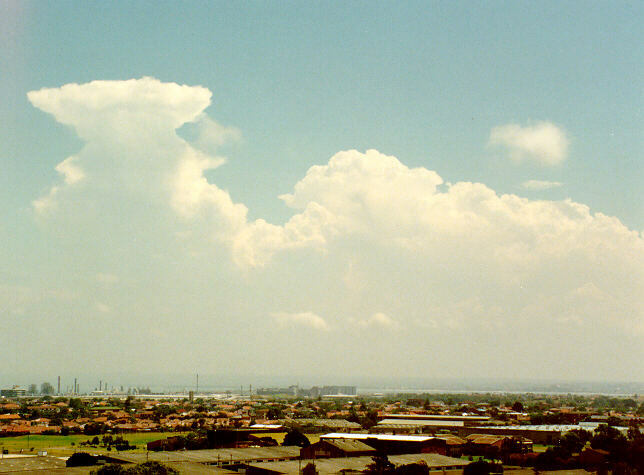 During the afternoon, the cumulus began to develop into thunderstorms. 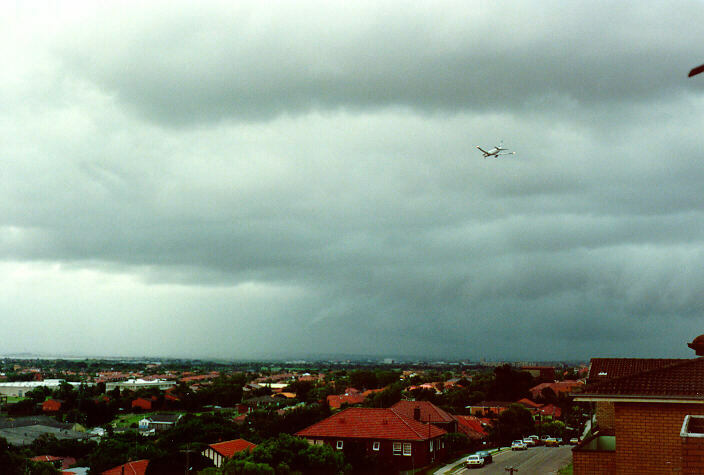 One hailstorm passed through Camden and Campbelltown moving S-SE and on to Wollongong. 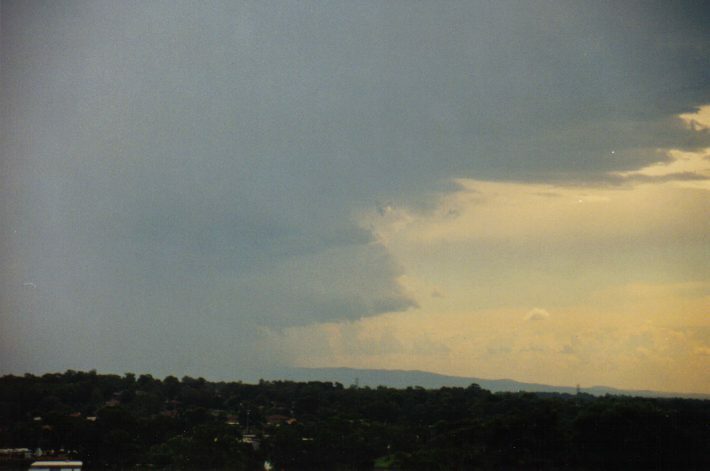 A warning for large hailstones, wind and heavy rain was issued for the Wollongong region. 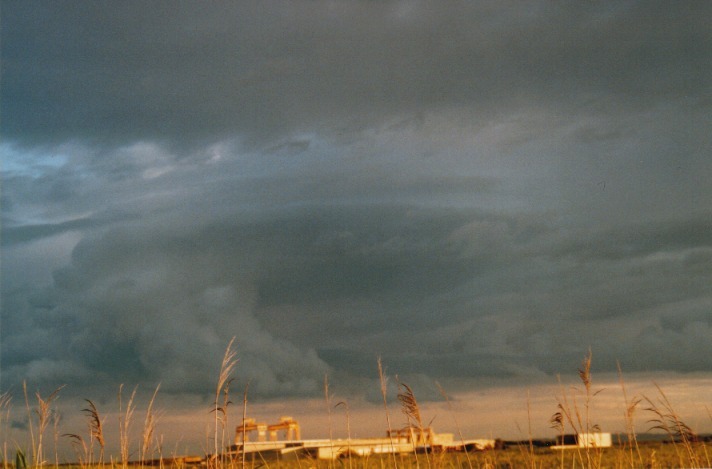 During the evening, the storm developed into a large system. 4th December 1993. 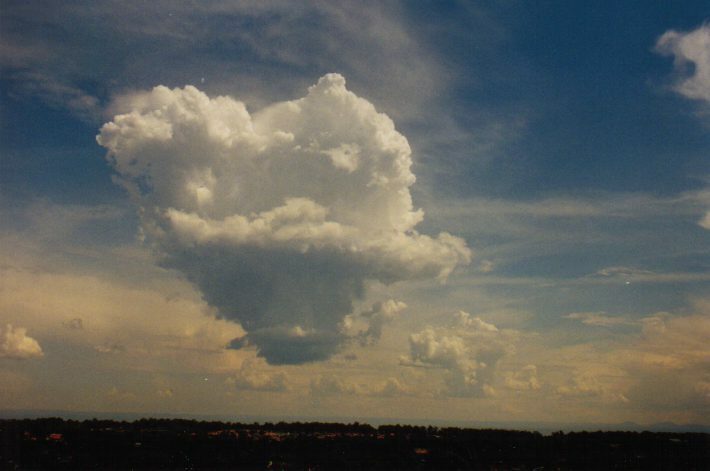 Large cumulus were developing on a typically unstable day and very hot day. 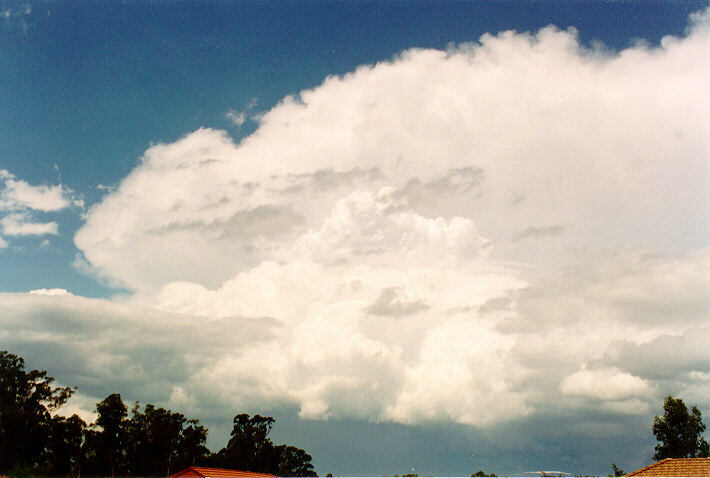 The first thunderstorms developed rapidly during the early afternoon period to the north probably around the northern suburbs area. There was a light green tinge observed under the base even though I was still in bright sunshine. 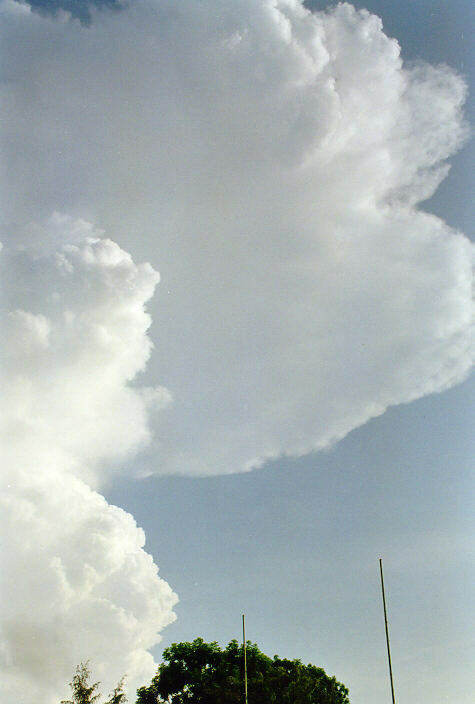 The cloud tops were very bright white and crisp with a nice back-sheared anvil. Unfortunately I did not have the camera with me on the way home but Michael Bath did. This storm system then moved east. I am unsure of what happened with this system as surprisingly there were no spotter reports from this particular storm!!! 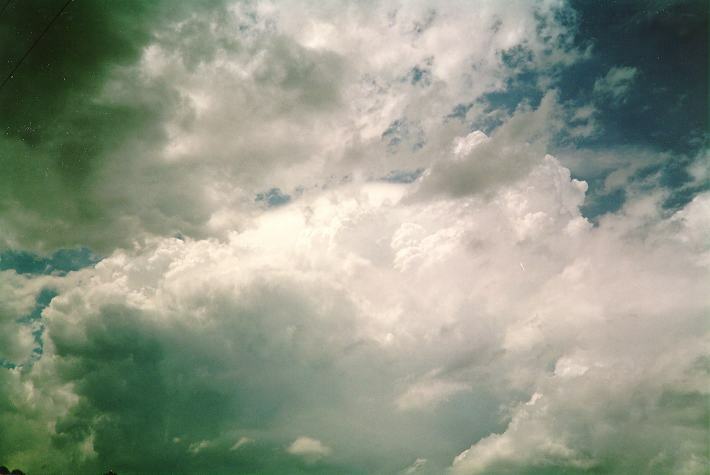 Later more cumulus developed ahead of another band of severe thunderstorms with large hail. 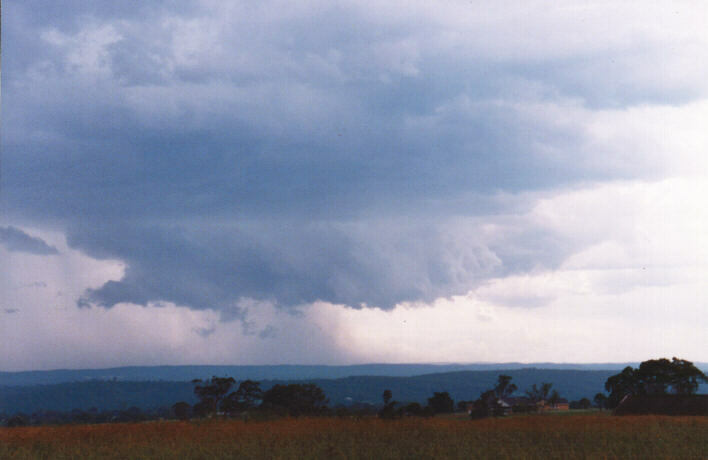 These affected the Hawkesbury region to the northwest of Sydney and then moved throught the Central Coast. 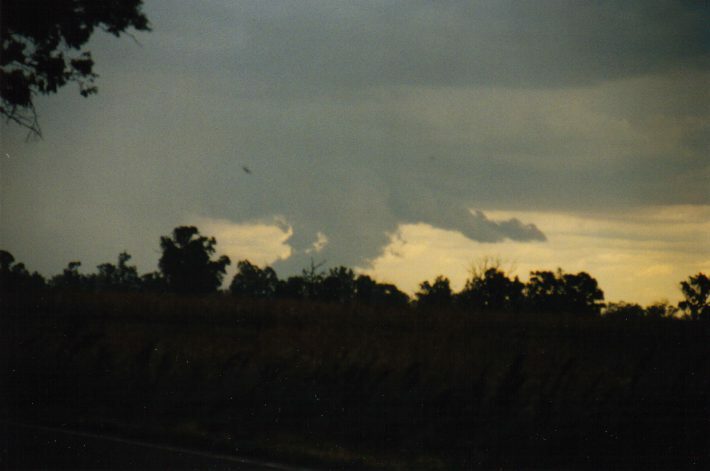 My parents situated to the north of this system described it is very dark and reminder them of another severe thunderstorm during the spring 1993. 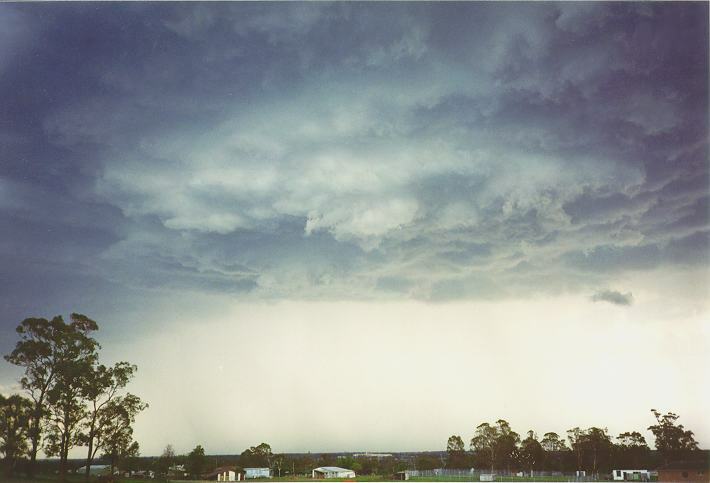 Severe weather advices were issued for the Central Coast and Hunter regions in response to the passage of this system and other storms. 1st February 1994. 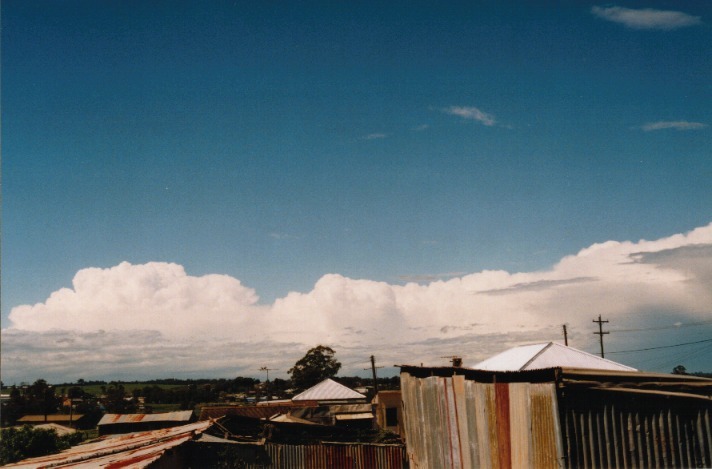 Large cumulus were developing on a typically unstable day. 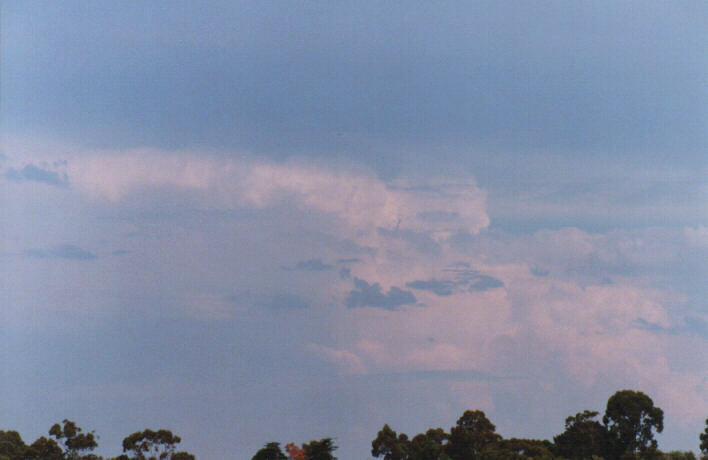 During the late afternoon, I observed a thunderstorm to the south probably around the Campbelltown area. Usually in this position, it would move east. But the more I observed it appeared to be approaching towards Schofields and Oakhurst. Its development occurred along the northern to north western flank. 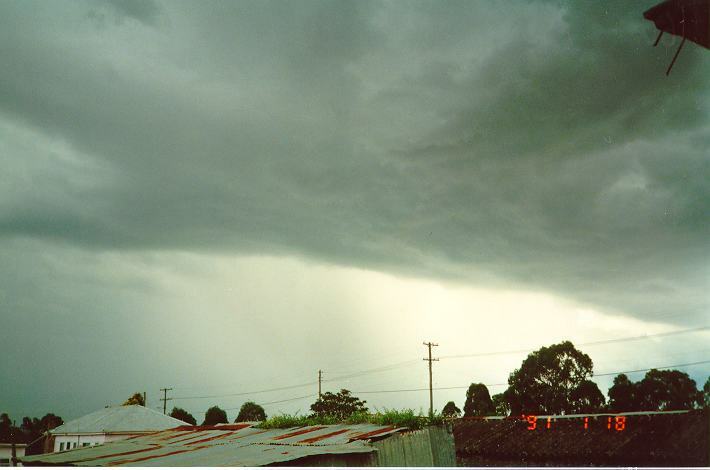 It had a large steep back and as it approached, the intense rain and hailshaft looked spectacular with a nice green tinge. 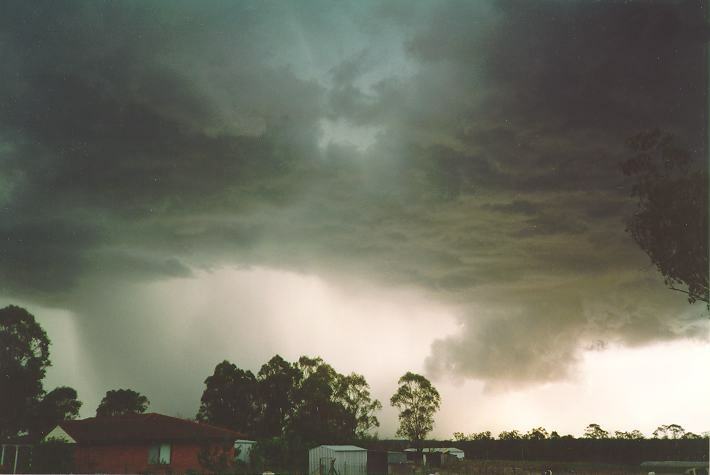 Michael Bath recorded very heavy rain and large hail to 3cm. Strong severe winds brought down trees in the Mt Druitt area. 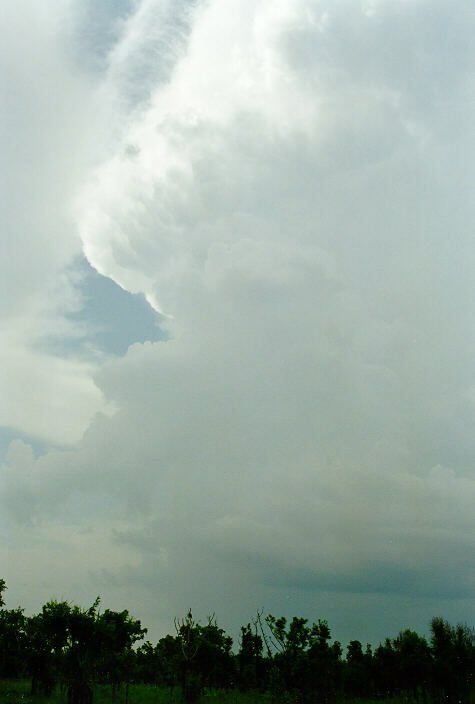 The storm continued to propagate northwest and dissipated soon after. 1st January 1995. A fresh northerly wind and unstable conditions. Cumulus developed over the mountains as usual. 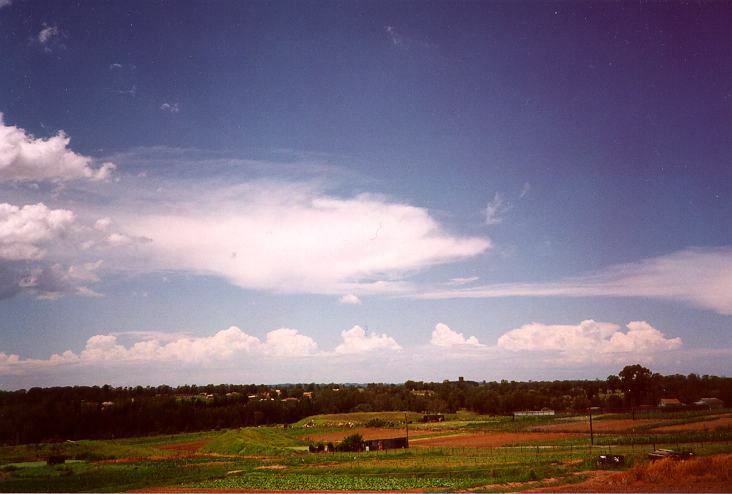 However, it was during the afternoon that anvils began to develop and although facing SE, the storms were approaching from the SW. One storm in particular approached Schofields and as the sun became hidden, a high contrast base was observed. 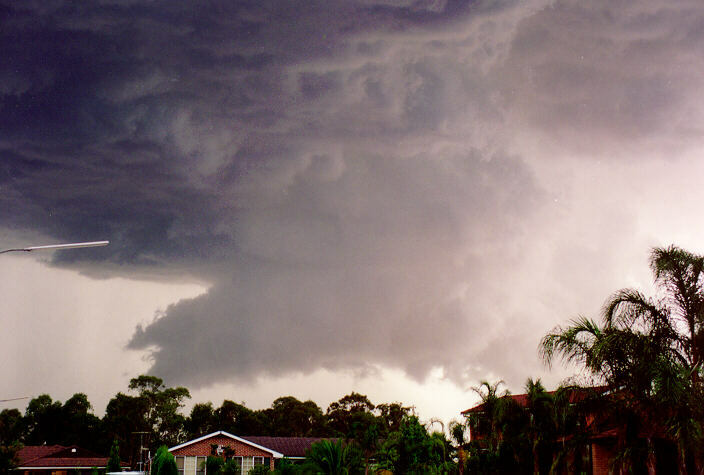 Due to the inflow of the lower level northerly wind and the wind shear, this base began to rotate. This wall cloud lasted around 20 minutes before the precipitation broke through. 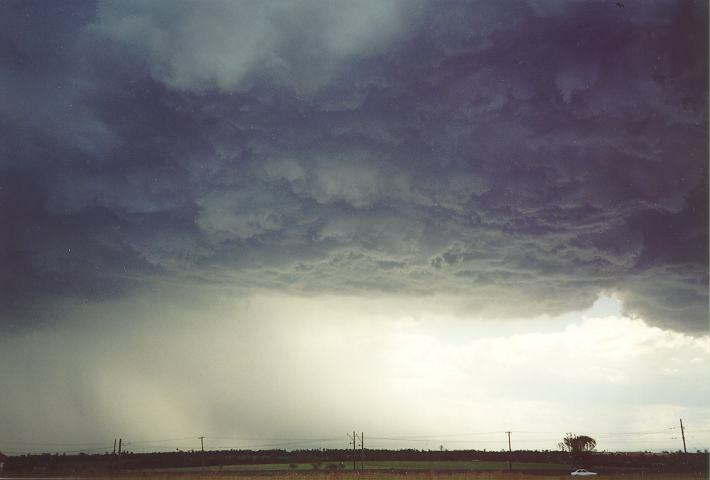 Hail and strong winds were recorded although this storm was rated as marginally severe. 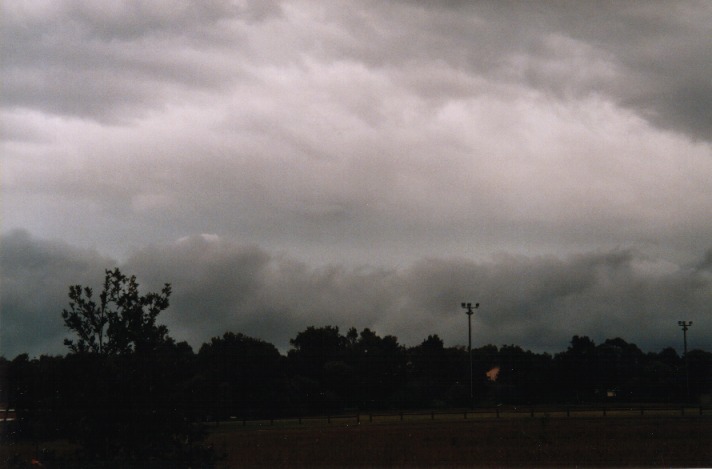 On the 13th of March 1999, unstable conditions associated with a trough line lead to the development of major widespread thunderstorm activity. 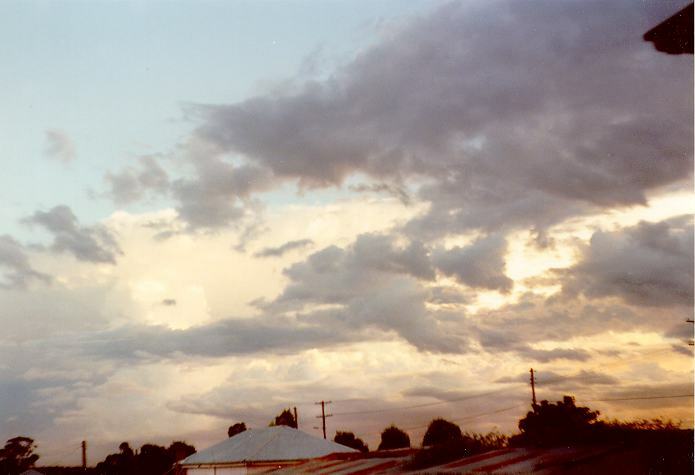 The storms developed from around midday and continued throughout the afternoon. 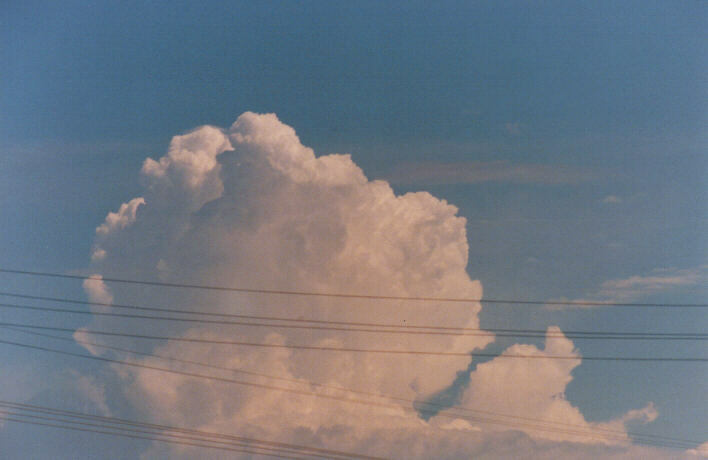 Earlier cumulus developed continuously with no dissipation stages. Some of these thunderstorms were severe. 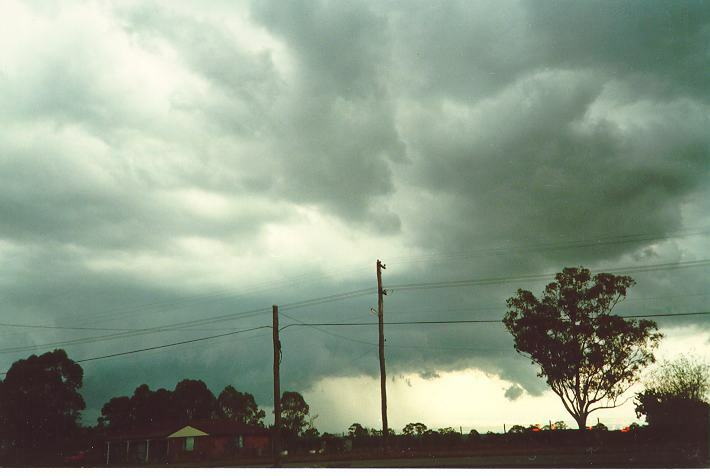 There were severe weather advices out for surrounding districts particularly to the S and later to the N of Sydney. 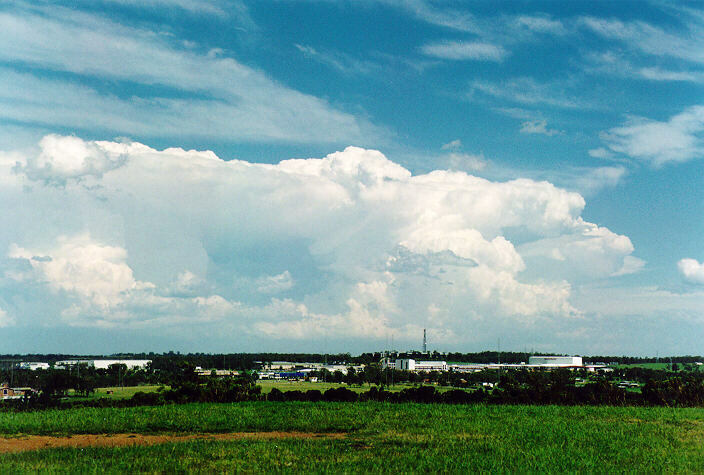 One of the most interesting features were the base structures below the developing cumulus and one of the observed thunderstorm. A nice spectacular cloud base! 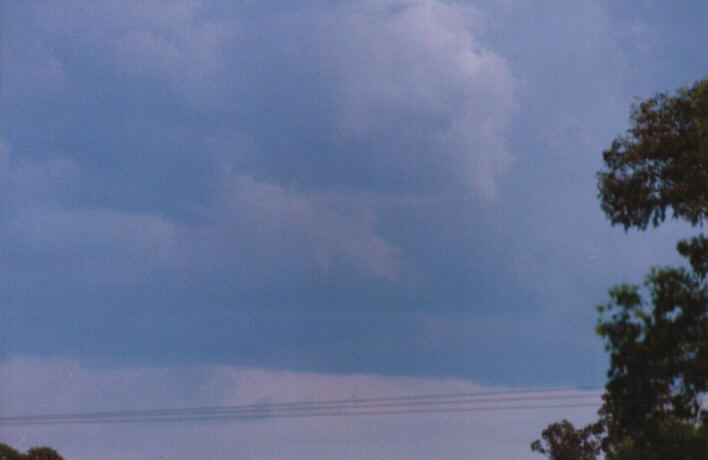 To add to the excitment, a pronounced funnel was also observed but lasted a minute or so. (The funnel is barely visible). 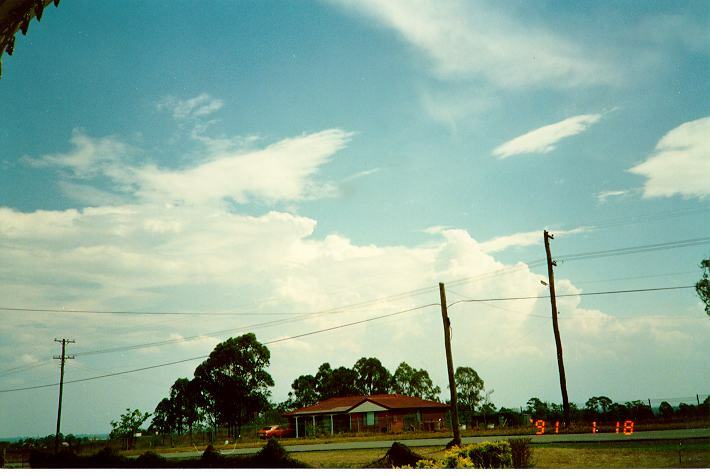 18th January 1991 was more or less your typical summer day with afternoon thunderstorms. However, what I found significant was the way the situation changed so quickly. 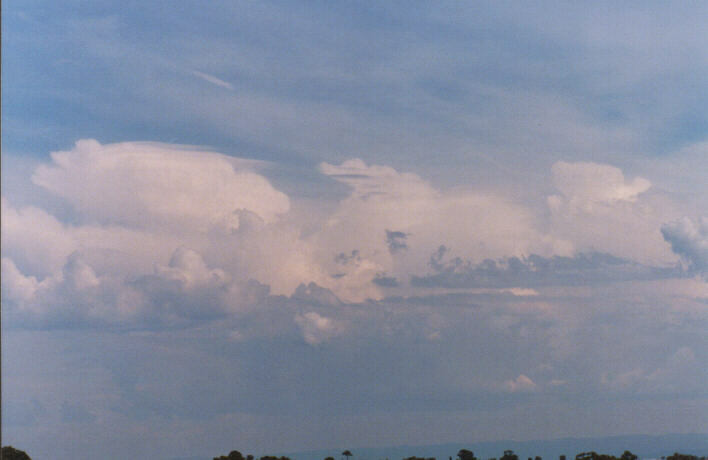 Storms had developed on the mountains with some intense activity. But this storm as well as another down to the far south had weakened. Simultaneously, a cell developed in between and intensified. 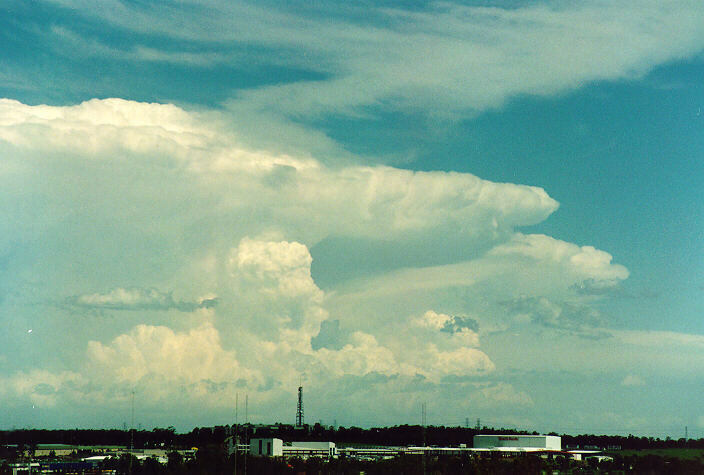 Although the anvil faced east, the multicellular activity directed the overall movement towards the north and northeast. 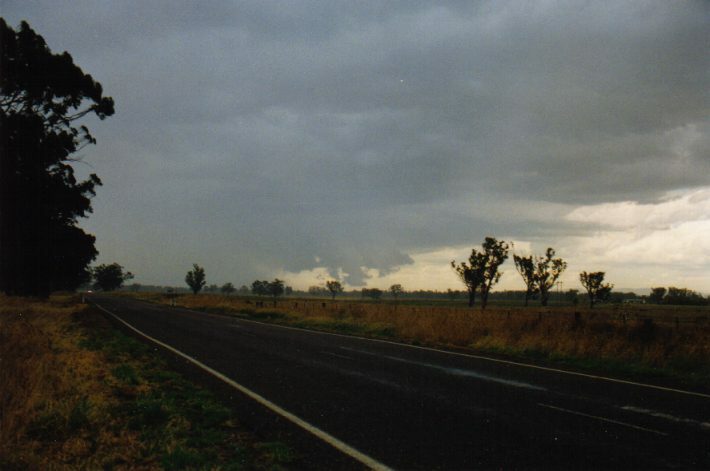 As it approached, it seemed as though that the activity would miss Schofields with very heavy rain and possibly hail falling up to a few kilometres to the south and southeast. However, more cells developed to our southwest and these amalgamated with the main cell and produced some brief very heavy rain and severe gusts of wind. It certainly looked ominous within the main cell. This was the first time I observed from close range a major cell dissipating and replaced by another new cell so quickly and to the south of the cell purely from an outflow boundary. 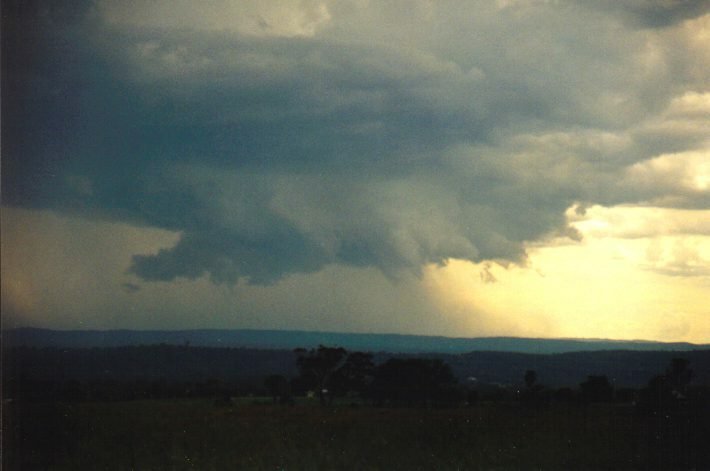 30th January 1999 was a big chase day for Sydney based chasers, Michael Bath, Jimmy Deguara and Matt Smith. 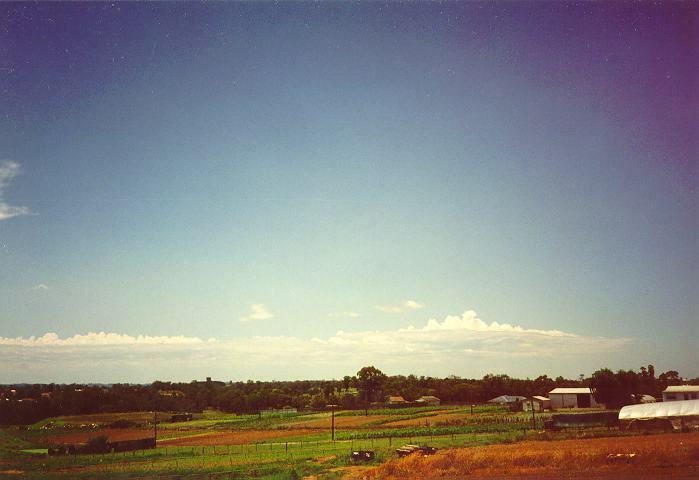 Escaping the stratocumulus gunge in the Sydney basin, we headed out for the the Northwest Slopes and Plains. 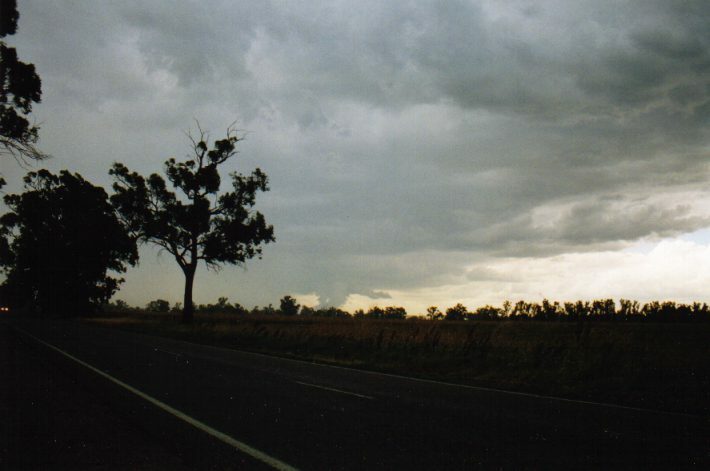 Arriving in Gunnedah shortly after 3pm, a disspiating funnel (probable tornado) was videoed. Heading further NW out of town, this awesome base lowering on the right moving cell of a possible splitting supercell thunderstorm was a sight to behold! 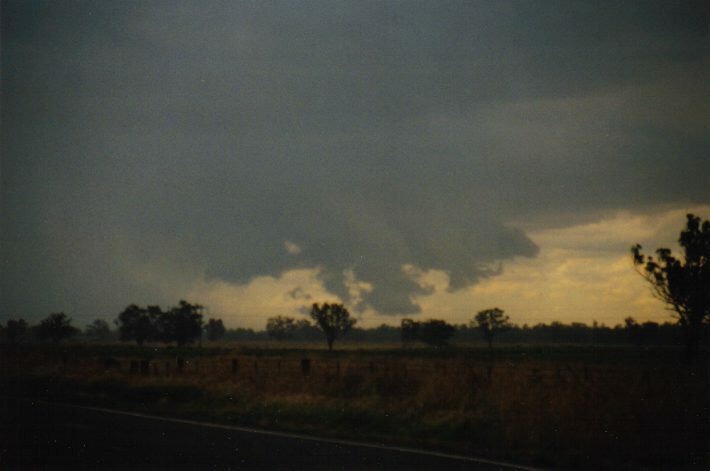 We thought we were on to an incredible wall cloud and tornado, but on closer approach realised that it was probably just shelf type clouds with possible gustnadoes. The area where this lowering occurred, resulting in severe damage to trees. 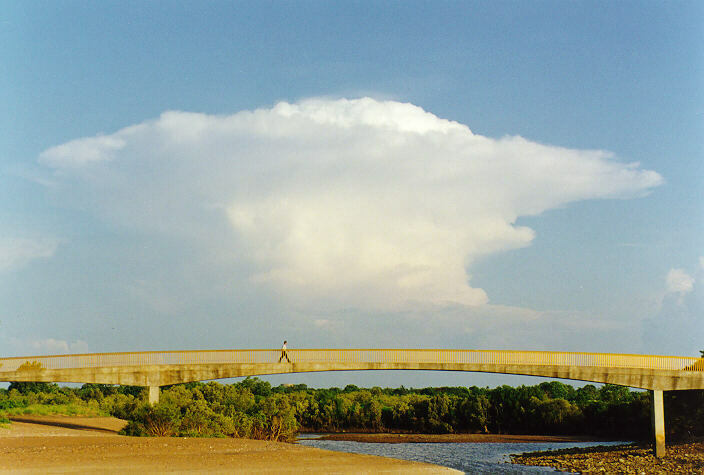 During late November and December 1997, Michael Bath took a trip to Darwin. 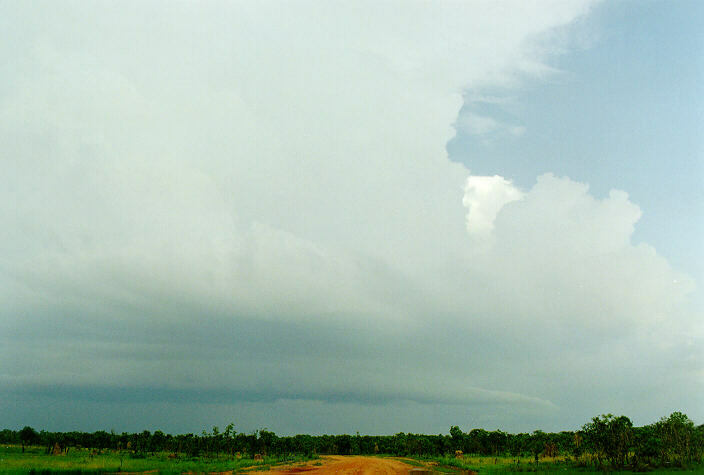 One of the main reasons was to observe the famous 'monster' sized thunderstorms Darwin produces. Included here are some of the many pictures Michael took. 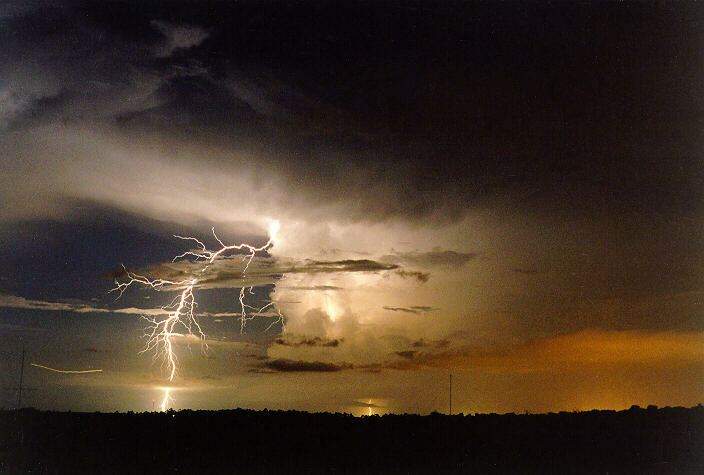 Although Darwin is famous for its spectacular lightning displays, Michael had few opportunities but did manage to capture this spectacular bolt! As you might expect, these storms can briefly develop structures indicative of severe weather such as shelf clouds and dense thick anvils. But since they grow in environments with relatively light upper level winds, they simply collapse upon themselves.